Planning to hike the Samaria Gorge on the island of Crete in Greece? Whether you're going alone or with a group, these tips can make all the difference to your day in the Samaria Gorge. While tens of thousands of people trek down the Samaria Gorge each season, it is not danger-free and some years there are one or two fatalities. 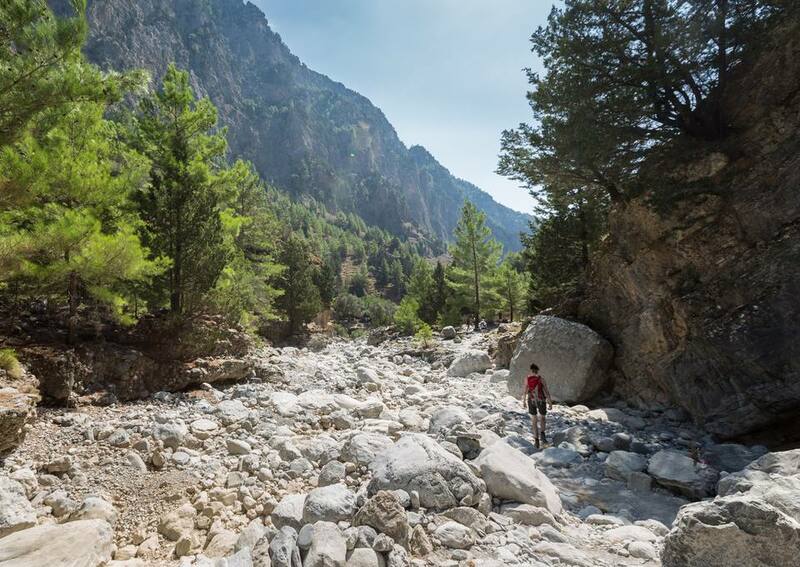 Rainstorms can bring flash floods and high temperatures can make the bottom of the Samaria Gorge feel - and be - airless. If it's too hot, skip your hike no matter what your tour group says. Usually, the park authorities will close the gorge if it gets too hot - but that won't help you half-way through. Temperatures will be milder at the top of the Samaria Gorge because of the altitude, and what starts as a nice warm day at the snack bar can turn into an inferno at the bottom. And since it's all downhill, with the steepest portion at the beginning, there is an easy way of going back if you discover it's too much for you. Your only choice, in that case, is to try to make it to the ranger station about a quarter of the way through or to the medical station at the otherwise-abandoned village of Samaria located halfway through the Gorge and ask to be taken out by donkey. Call on the day of your Samaria Gorge hike, especially if you're doing it yourself and not as part of a bussed group. It may close for bad weather, hot weather, or the occasional strike by workers. You will not have to carry more than a liter bottle, which you will refill at the springs along the way. It can be much cooler at the top of the Samaria Gorge than at the bottom. Hiking boots are not necessary for most people walking the Samaria Gorge. Much of the lower trail is on rounded river rock, and good hiking shoes seem to handle these better than boots. If you have a choice, a well-ventilated hiking shoe may be useful to you especially if it's hot. But wear a comfortable, well-broken-in shoe and if possible, test it first by going down a steep hill and see where any unexpected pinch spots seem to be. I often wear double socks in the Gorge, and that seems to help. If you have a known hotspot for blisters, use moleskin on it before starting the hike. Some people put also petroleum jelly between their toes or wear double socks, and these also seem to help. Use a walking stick or two, if you like. I find one is best. It helps on scrambling along those round rocks. There are also some ladder bridges (think of a ladder laid across rocks) toward the end, usually just a foot or two above the water. Not hard to do but a surprise to me on my first hike! In fall, it's likely the water in the Dictynna River will be minimal. Expect deeper waters in spring. Buy a sandwich without mayonnaise at the lunchroom at the top of the Samaria Gorge, eat half there and then save the rest for when you reach the old village of Samaria which is midway down the Gorge. Have a honey nut bar or some other sweet with you for energy. The steepest, most accident-prone section of the Samaria Gorge is right at the beginning, at the so-called "Xyloscalo" or "wooden staircase", actually a series of shallow terraced steps. Please don't trust the guardrail with your full weight. If you see a donkey and its keeper coming up toward you on the Xyloscalo, immediately press yourself against the wall and wait until they pass. Do not let the donkey get you between itself and the sometimes-flimsy wooden railing. Also avoid letting the donkey get close enough to get a thread from your clothing tangled in its panniers, dragging you along until you tear loose. Trust me on this one. It's no fun. The round stones can turn an ankle. If you do injure yourself so that you cannot walk, the only way out is by evacuation donkey (often sharing the string with the Garbage Donkey - not recommended). None of the Samaria Gorge is really "hard", except the length. There's only one spot that you might feel any need to use your hands, and only one very short uphill section - think fifty feet. There's a trail register at the village of Samaria in the Gorge - most people miss it. It's to the left of the bridge heading toward the buildings. This is also where you may see tame kri-kri goats. Not Up to All This? Take the “Easy Way”! Since many people want to see the dramatic "Sideroportes" or "Iron Gates" where the Gorge walls soar into the sky and the pathway goes through an opening only about nine feet wide, tour companies offer the option of bussing to Chora Sfakia, taking a ferry to Agia Roumeli. and walking up the Gorge from there. The Sideroportes is about an hour and a half inside the Gorge. In ancient times, the Gorge was home to a famous oracle site which attracted pilgrims from as far away as Libya. There was a temple to Apollo at Caeno, usually considered to be the ranger station area, and an even more ancient one to Dictynna and her daughter Britomartis, Minoan goddesses who once ruled the Gorge. If you are traveling in spring, you'll note the smelly, dramatic Dragon Lillies, huge deep-red spikes rising up from fringy leaves and spotted stems. These were believed to be sacred to Apollo but probably were originally sacred to Britomartis. Their carrion scent attracts flies who fertilize the flowers like bees. The giant gray mountain at the beginning of the Gorge, Giglio, or Sapimenos, was thought to be the throne of Zeus on Crete and also the location he used to conduct horse races. Large boulders at the bottom of the Gorge are said to be his thunderbolts.